Survival is a Killing Floor 2's signature gamemode. In this mode players equiped with various perks and weapons withstand the armies of AI-controlled enemies throughout the set of waves and face off one of the four bosses and the last wave as an ultimate challenge. In Survival mode players play either together (co-op) and alone (solo), before starting the game players can choose game length (either 4, 7 or 10 waves where 5th, 8th and 11th waves are being Boss waves) and game difficulty (Normal, Hard, Suicidal or Hell On Earth) which defies game's pace, amount of the ZEDs to spawn, damage and health variables and many other factors. As a rule of thumb, solo games are always easier to play through due to various indulgences given to survivors such as getting healed more, having less powerful and beefy ZEDs and overall less ZEDs to deal with and so on. Survival's only winning condition is to made your way through all the waves and kill the boss. Should all the players fail in this task, game ends and players loose. In co-op games in require your entire squad to get wiped out before moving to the next map as a loosers. If squad member dies during the wave time, they have to wait for their remaining team mates to carry on along and will only spawn once the wave is done. Fallen teammates drop their last held weapon (only one being droped) which has an internal hidden timer where it can stay on the ground before disappearing and are suffering from on-death Dosh penalty loses. Hence sharing money and watching over player's weapons (picking them up and droping again resets the timer) is a basic principle of survival. "In either Co-Op or Solo mode, players engage hordes of AI controlled Zeds across multiple waves until they reach the boss or die trying. 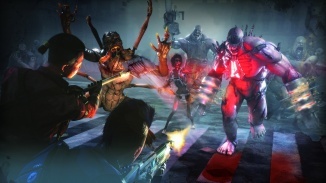 The players can select from a variety of perks, each with its own skills, powers, and weapons, in addition to choosing from among several playable characters with different appearances and personalities. Against the players are arrayed a multitude of Zeds, from lowly, slow clots to bosses like the mighty Patriarch." ZED's health and attack power goes up with the game difficulty. Difficulty defies amount of ZEDs to spawn and how fast they spawn. On higher difficulties ZEDs are likely to use more advanced attacks and moves. ZEDs speed, sprint odds and blocking and evading capabilities grow up with the difficulty. More advanced (Elite) ZEDs are likely to replace they normal counterparts on the higher difficulties. Game Conductor controls the game flow. Game difficulty affects amount of earned Dosh, as well as a quantity of items and ammo boxes on the map. Difficulty affects amount of ZEDs to exist on the map at the same time (mostly relevant for Solo games). Amount of ZEDs = Base Amount x Wave Size modifier x Wave Length modifier. ZEDs spawn in squads, within certain time intervals. Minimum time between squad spawns - 1s. For more than 6 players games: Wave Length modifier increases linearly from x4.5 to x10 (which is the cap) with the interpolation amount of (Num Living Players - 6 / 32 - 6), meaning that x10 cap can be achieved upon having at least 32 players on the server. Maximum amount of ZEDs that can exist at the same time depend on game difficulty and how many players are there. Hans Volter - 8, Patriarch - 8, King Fleshpound - 32, Abomination - 10. In Survival mode on official maps starting from wave 2 there is 35% chance for an optional "Stand Your Ground" objective to appear. It is an optional tasks rewarding players with Dosh, XP and Vosh. Upon receiving such objective players will be having 20 seconds (usually) to make their way into the designated area of the map and defend it from ZEDs. This page was last edited on 13 March 2019, at 10:55.